Friday, March 17, 1809.Elizabethtown, KY.
Monday, March 17, 1834.New Salem, IL. Tuesday, March 17, 1840.Jacksonville, IL. Josiah Lamborn replies to Baker's address. Lincoln follows Lamborn in speech at Market House. Before he has finished, he is requested to postpone balance of his speech until night. Douglas then takes stand. At court house in evening, Lincoln speaks for two hours. He reads from Treasury report list of defaulters to prove corruption in Van Buren Administration.Register, 27 March 1840. Thursday, March 17, 1842.Springfield, IL. Logan & Lincoln purchase of Ninian W. Edwards "east half of the west half of lot six, block fourteen, in the town, now city of Springfield" for $400.Record; ISLA—Bulletin, No. 16. 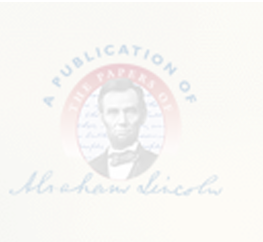 Lincoln files petition for dower and partition in Crow & Crow v. Crow et al. in Sangamon Circuit Court.Record. Friday, March 17, 1843.Springfield, IL. Register reports: "Our ears are stunned here, just now, by the din of the Whigs, concerning Lincoln and Baker, as to which shall go to Congress from this district. . . .
"The Junto are organized here—they have their secret agents ready to visit the several counties. . . . They will choke down the throats of the Whigs of Tazewell, Morgan, Scott, . . . whatever candidate they please. . . .
"Next Monday . . . the Whigs of Sangamon are to make choice between Lincoln and Baker. Whichever candidate is defeated, is to withdraw. . . . This is done in order to give Sangamon the candidate. . . . Lincoln, Baker, and Logan, have all to be satisfied in turn, before any other county can get even a slice. Poor Stuart! he is tetotally forgotten." Monday, March 17, 1845.Springfield, IL. Sangamon Circuit Court opens 13-day term. Indictment for manslaughter is read in People v. Dorman. Lincoln is attorney for defendant. In two cases of Klein v. May, plaintiff is awarded judgments by default for $86.70 and $966.05. Logan & Lincoln appear for defendant in these two cases. They have two cases continued, and Barrett v. Saunders and Beck is dismissed by agreement.Record. Tuesday, March 17, 1846.Springfield, IL. Three appeal cases are dismissed, Wood v. Jones, Brown v. Crafton, and Talbott v. Washburn. Lincoln appears alone for appellant in first, with Herndon for appellee in second, and for appellant in third.Record. Wednesday, March 17, 1847.Springfield, IL. Plaintiff in Duryee v. Dikeman fails to file bond and case is dismissed. By consent, Wallace v. Billings, in which Lincoln represents appellant, is set for later hearing. Lincoln, for defendant in Alexander v. Brown, assumpsit, moves continuance. Court overrules, and he enters pleas. Record. Friday, March 17, 1848.Washington, DC. Lincoln answers two roll calls. House considers private bills and debates resolution to print 90,000 copies of report of commissioner of patents.Journal. Monday, March 17, 1851.Springfield, IL. Sangamon Circuit Court begins spring term. Lincoln & Herndon have two assumpsit suits. They dismiss first, and in second, defendant defaults. Record. In evening Whigs hold meeting at courthouse. William H. Herndon is again nominated for city clerk and attorney. There is no record of Lincoln's attendance but he is probably there. Illinois Journal, 19 March 1851. Wednesday, March 17, 1852.Springfield, IL. Injunction in Perrin v. Hull et al. is dissolved. In E. M. Henkle & Brother for use of Jacob Bunn v. DeCamp and Burnap, defendants default and Lincoln & Herndon's client is awarded $185.08 damages. Lincoln & Herndon dismiss one case, file pleas or enter motions in four others and one is continued. Record. Thursday, March 17, 1853.Springfield, IL. Lincoln buys 92¢ worth of gingham. Pratt, Personal Finances, 146. Monday, March 17, 1856.Springfield, IL. In U.S. Circuit Court, juries award damages in three cases against Chicago, Alton & St. Louis Railroad in which Lincoln appeared March 3, 1856. Hotchkiss is awarded $50,000 and damages of $1,496.55; the New Haven County Bank $101,873.40 and damages of $5,557.93; Brown et al. $252,145.73 and damages of $5,379.03. In United States v. Wilson, Lincoln and Allen argue plaintiff's demurrer. Record. Saturday, March 17, 1860.Springfield, IL. Lincoln, Hatch, Dubois, and Herndon have farewell interview with Gov. Bissell, mortally ill and sinking rapidly. Chicago Tribune, 23 March 1860. Lincoln writes E. Stafford that financial part of arrangement Stafford proposes is impossible. He cannot raise $10,000; "nor have my friends, so far as I know, yet reached the point of staking any money on my chances of success." He also writes to James W. Somers, Urbana attorney, advice about Somers' thought of moving to Chicago, Missouri, or Kansas. Abraham Lincoln to E. Stafford, 17 March 1860, CW, 4:33; Abraham Lincoln to James W. Somers, 17 March 1860, CW, 4:33. Sunday, March 17, 1861.Washington, DC. Lincoln attends morning church service with Gen. Scott. N.Y. Herald, 18 March 1861. Discusses diplomatic appointments with Sec. Seward. Don C. Seitz, Lincoln the Politician: How the Rail-Splitter and Flatboatman Played the Great American Game (New York: Coward-McCann, 1931), 245. Monday, March 17, 1862.Washington, DC. President confers with Gen. Fremont, assigned to command new department. N.Y. Tribune, 18 March 1862. Rumor reaches Lincoln of resolution that may be offered by Congressman John Covode (Pa.) to remove General George B. McClellan from command. Evening Star (Washington, DC), 17 March 1862, 2d ed., 3:6. "War politicians of the 'Tribune' school have seen the President . . . with a view to displacing McClellan." Boston Advertiser, 19 March 1862. President welcomes committee bearing resolutions passed by East Baltimore Conference of Methodist Episcopal Church. Evening Star (Washington, DC), 8 April 1862, 2d ed., 1:2. In presence of Sec. Stanton , interviews Cornelius Vanderbilt, railroad builder and philanthropist, and accepts yacht offered as gift to government. DNA—RG 59, General Records, Dept. of State, Vanderbilt to Seward, 3 May 1866. Tuesday, March 17, 1863.Washington, DC. Lincoln sends for Asst. Sec. Fox to learn about failure of Rear Adm. Farragut to run by Port Hudson, La. Fox, Diary, Gist-Blair Family Papers, Library of Congress, Washington, DC. Cong. Henry W. Davis (Md.) discusses organization of new House of Representatives with President. Abraham Lincoln to Henry W. Davis, 18 March 1863, CW, 6:140-41. Cabinet meeting continues subject of privateering. Bates, Diary. President Lincoln and his wife, Mary, tour the Patent Office. A newspaper reports, "This temple of American genius has lately received additions . . . Mrs. Lincoln, with characteristic unselfishness, has sent from the White House a splendid variety of the presents of the Kings of Siam and the Tycoon of Japan. Among the most noticeable is a suit of Japanese armor . . . for which the Knight of La Mancha would have given his boots. . . . The President and Mrs. Lincoln seemed to enjoy greatly this respite from the cares of State among so many interesting objects." New York Herald, 20 March 1863, 4:5. Lincoln writes to Major General William S. Rosecrans and responds to the general's list of complaints. Rosecrans recently achieved a military victory, which, he claims, prompted Secretary of War Edwin M. Stanton to offer Rosecrans "'Anything you & your command want.'" Rosecrans complains that he did not receive the military commission date he requested. Lincoln responds, "Truth to speak, I do not appreciate this matter of rank on paper, as you officers do. The world will not forget that you fought the battle of 'Stone River' and it will never care a fig whether you rank Gen. [Ulysses S.] Grant on paper, or he so, ranks you." William S. Rosecrans to Abraham Lincoln, 16 March 1863, Abraham Lincoln Papers, Library of Congress, Washington, DC; Abraham Lincoln to William S. Rosecrans, 17 March 1863, CW, 6:138-40. Writes Joshua F. Speed: "Confidential. . . . Lyman Guinnip [dealer in agricultural implements at Danville, Ill.], is under an indictment at Louisville, something about slaves. I knew him slightly. . . . I scarcely think he is guilty of any real crime Please try if you can not slip him through." Abraham Lincoln to Joshua F. Speed, 17 March 1863, CW, 6:140. Thursday, March 17, 1864.Washington, DC. Lincoln requests Gen. Butler to telegraph, if "you obtain the remains of Col. Dahlgren." Abraham Lincoln to Benjamin F. Butler, 17 March 1864, CW, 7:251. Writes Cong. Creswell (Md. ): "It needs not be a secret, that I wish success to emancipation in Maryland. It would aid much to end the rebellion." Abraham Lincoln to John A. J. Creswell, 17 March 1864, CW, 7:251.